French interior and furniture designer, Emile-Jacques Ruhlmann acquired wide renown thanks to the valuable production of the interior design firm established in partnership with Pierre Laurent, embodying the charm of the French Art Deco style of the 1910s and 1920s. Emile-Jacques Ruhlmann was born in Paris in 1879 into an Alsatian family who were in the general decorating business. When his father died in 1907 he took over the family firm. 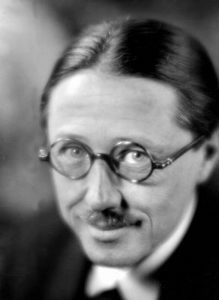 In 1919, he founded an interior design company with designer and friend Pierre Laurent the Établissement Ruhlmann et Laurent, specializing in interior design and producing luxury home goods that included furniture, wallpaper, lighting and bronze objects. By this time, Ruhlmann was making formal elegant furniture using exotic woods and inlays of ivory, lacquer, precious metals, and scrollwork, giving them a classic, timeless appeal. By 1927, Ruhlmann’s shop had grown to two locations employing 27 master cabinetmakers, four finishers, a dozen upholsterers, a few apprentice cabinetmakers and twenty-five draftsmen. However, the worldwide economic depression following the stock market crash of 1929 brought an end to the luxurious lifestyle that maintained an audience for Ruhlmann’s designs. Ruhlmann died on November 15, 1933 in Paris at the age of 54. 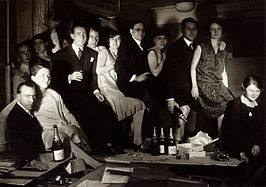 Ruhlmann (with glasses) and his employees, 1931. What Were His Major Works? Ruhlmann’s designs were purchased both in France and abroad to decorate palaces, political estates, and national museums. Today, his work is included in the permanent collections of the Metropolitan Museum of Art, the Brooklyn Museum, the Smithsonian Cooper-Hewitt National Design Museum, and the Museum of Fine Arts in Boston, among others. Corner Cabinet: Ruhlmann and Laurent’s furniture was very sought after and luxurious. 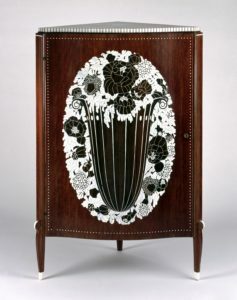 In a modern key, the glories of the Parisian cabinet in the days of Louis XV, Louis XVI and the Empire were re-enacted, echoing some characteristics, in addition to the similar use of precious techniques and materials. This corner cabined is made by using kingwood (amaranth) veneer on mahogany and inlays of ivory. 2. Fuseaux Cabinet: It was designed and manufactured during 1920 to 1949 in France, by using rosewood and ivory. Only seven copies of this small cabinet are known to date, including one at the Metropolitan Museum of Art in New York, and one at the Musée des Beaux-Arts in Lyon. Both were already acquired directly from Ruhlmann in 1925 on the occasion of the major art trade exhibition in Paris. For the production of one of the cannulated legs alone, about 50 working hours were required. This table was manufactured circa 1921. How Can We Identify Ruhlmann’s Style? Once Emile-Jacques Ruhlmann said that “To create something that lasts, the first thing is to want to create something that lasts forever.” His early designs reflected the popular Art Nouveau influence in France at the turn of the century. 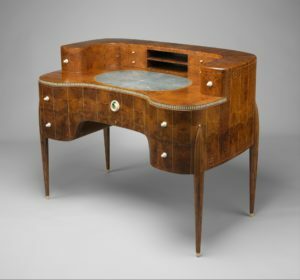 Later, his influences could be traced to architects and designers who create innovative furniture in Vienna around the time of the First World War. 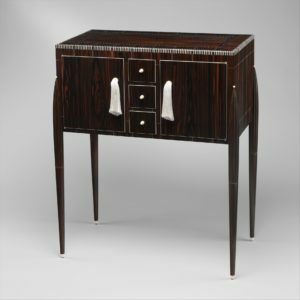 Its strongest inspiration could come from the classic design elements and craft ideals found in 18th century furniture. Ruhlmann would then model these same ideals in what he called his precious pieces. The hallmarks of these early works were their almost imperceptible curves and elegantly subtle uses of ivory. These pieces were more often embellished with ivory which gave a static sense of control to the pieces that made them unique, timeless and extremely elegant in shape. Over time, however, his style became more functional and modern, and occasionally even modular. His two favorite woods; Macassar ebony and amboyna root create both soft but surprising patterns of background, without focusing on the wood itself.